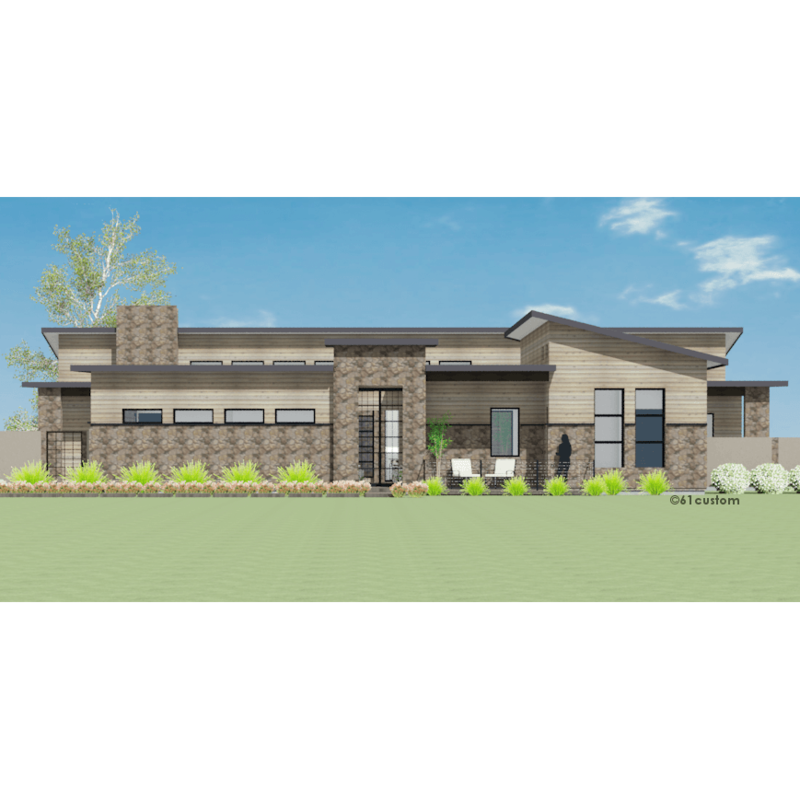 3756sqft – 4126sqft modern courtyard house plan with a front-central courtyard, open greatroom with wetbar, large kitchen, and formal parlor with a fireplace. 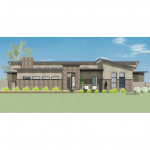 This semi-custom plan includes several optional extensions and exterior elevation choices at no additional charge. 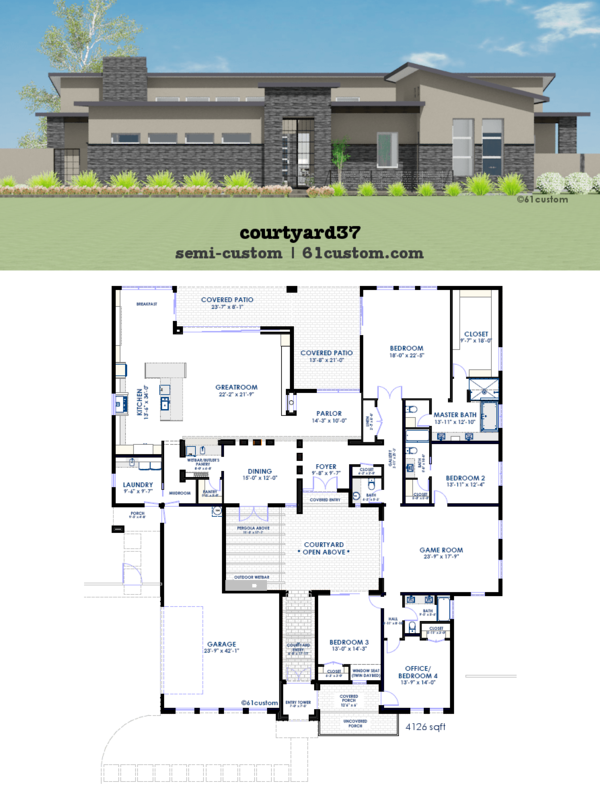 This 3756sqft – 4126sqft modern house plan was designed around a central front courtyard. Guests enter through a gated tower, and proceed through the courtyard to the double-door entry. Upon entry, you’ll see a warm “parlor” sitting area with windows to the back and a two-way fireplace that’s shared with the adjacent greatroom. 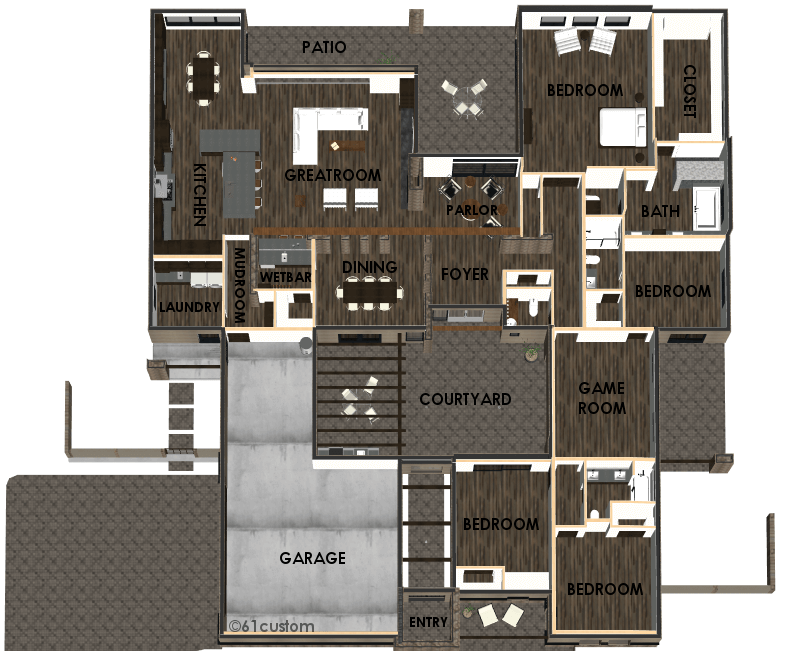 This 4 bedroom house plan has a large greatroom with wetbar, and a separate game room/teen room. 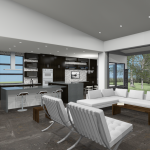 The dining room opens out to the central courtyard and outdoor bbq area with a sink and under-counter refrigerator. The kitchen is equipped with an over-sized island, built-in ovens, and 48″ refrigerator. 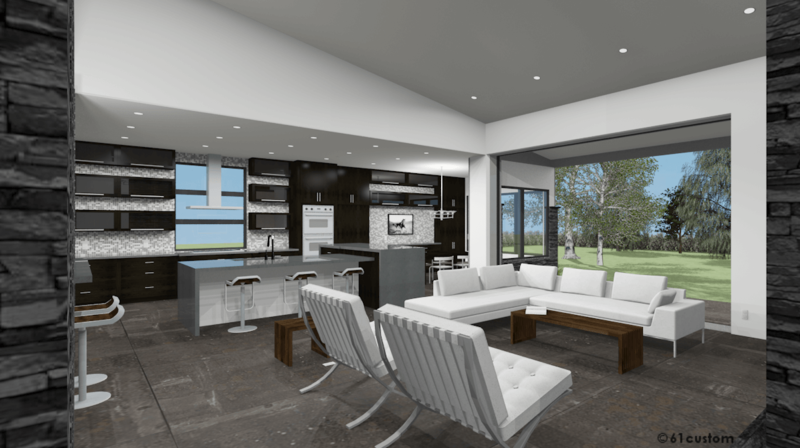 The 16′ pocket door in the great room opens fully, giving the kitchen/living area an indoor-outdoor feel. 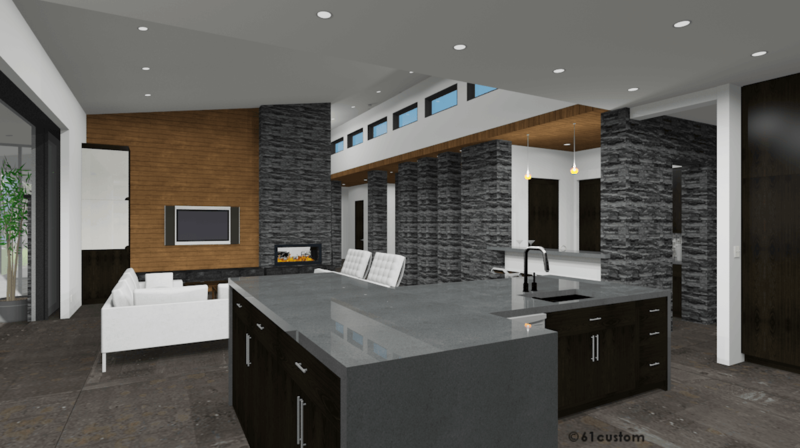 Varied ceiling heights and 8ft interior doors add interest and an open feel. A mudroom area at the garage entry is a great place for a bench and storage for coats, shoes and backpacks. The over-sized laundry room is bright and roomy. Split bedrooms offer privacy, and with four separate outdoor patio areas, there’s a space for everyone to relax or play. 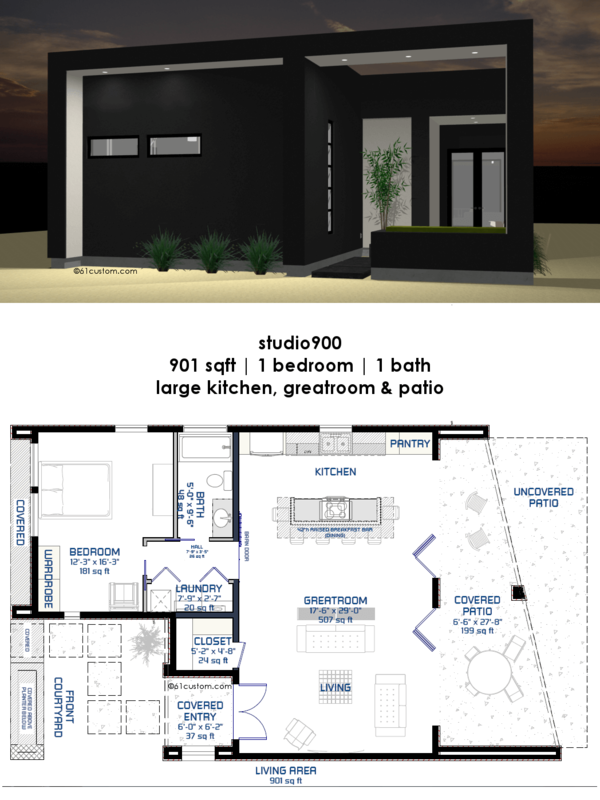 Several optional extensions and exterior elevation choices allow for flexibility. Choose your plan set type: standard or preliminary. 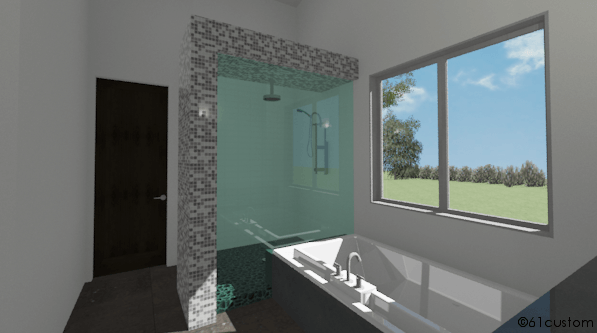 CAD files are also available – please request an estimate. 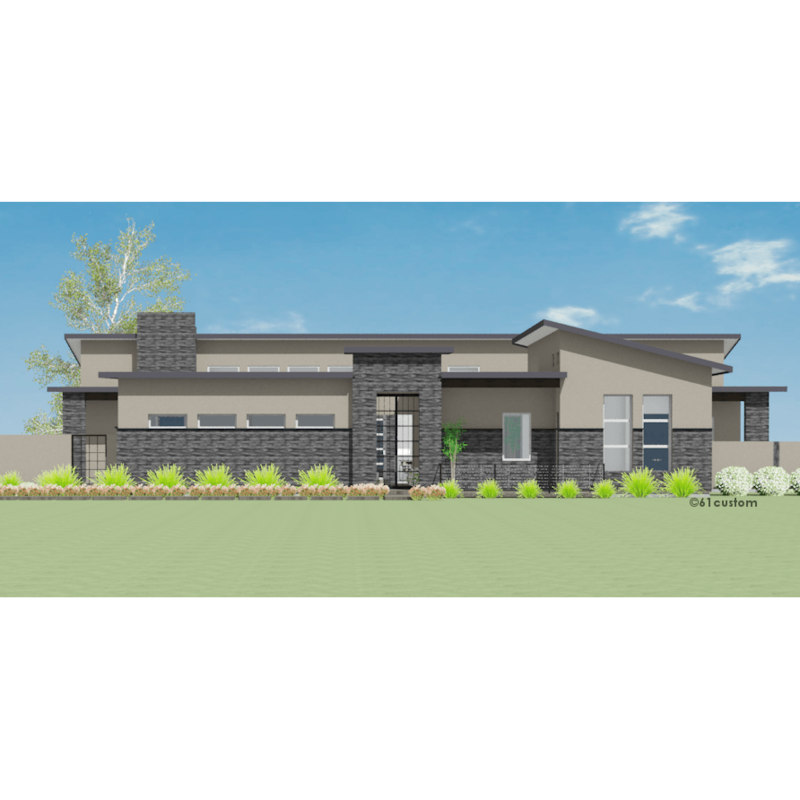 Choose the exterior style – Contemporary, Southwest Contemporary (flat/parapet roof) or Transitional. Choose your exterior finish – siding or stucco. 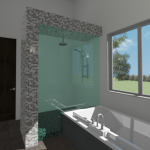 Both have cultured stone accents. 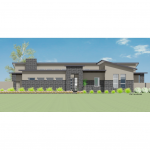 Choose front or side entry garage. Would you like to add the optional exercise room i.l.o. tandem garage bay? 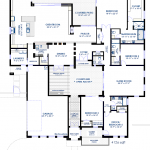 Would you like to add the game room extension? 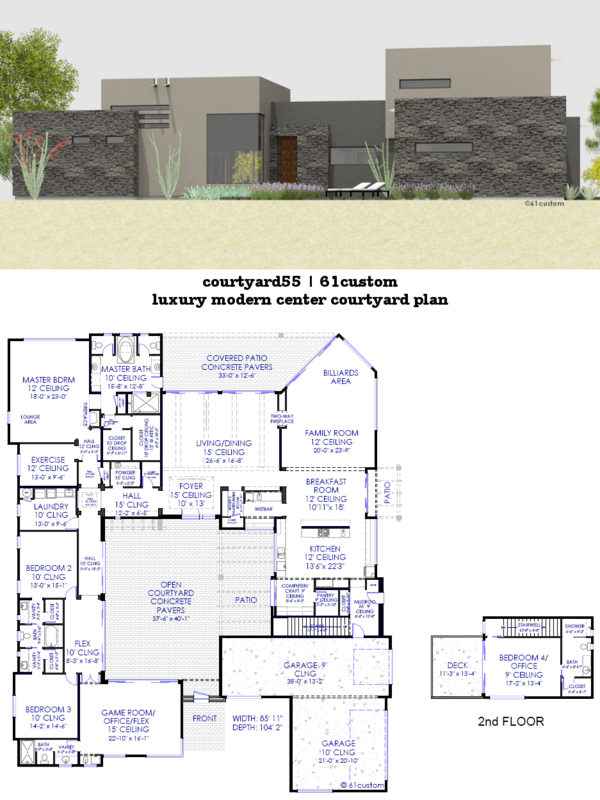 Would you like to extend the breakfast room and back covered patio? 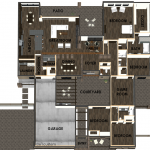 Would you like to extend the master closet? 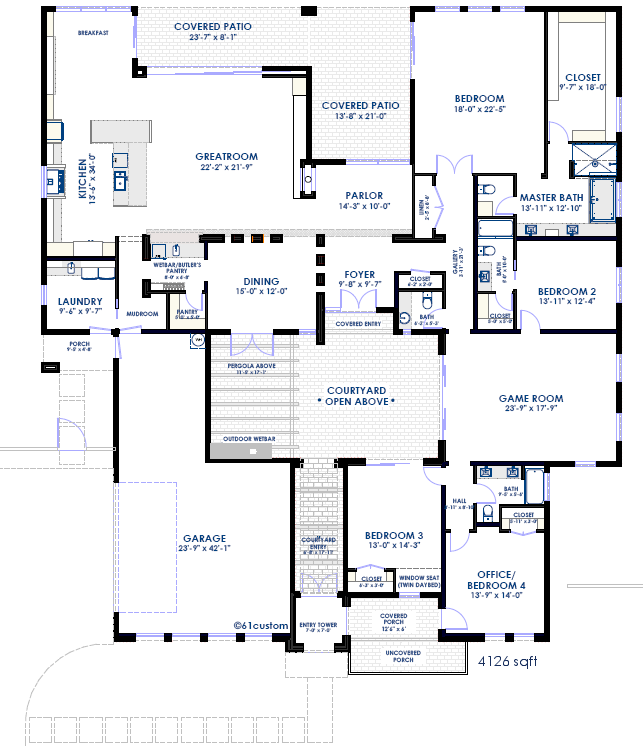 Would you like to extend both the master bedroom and master closet? Place your order. 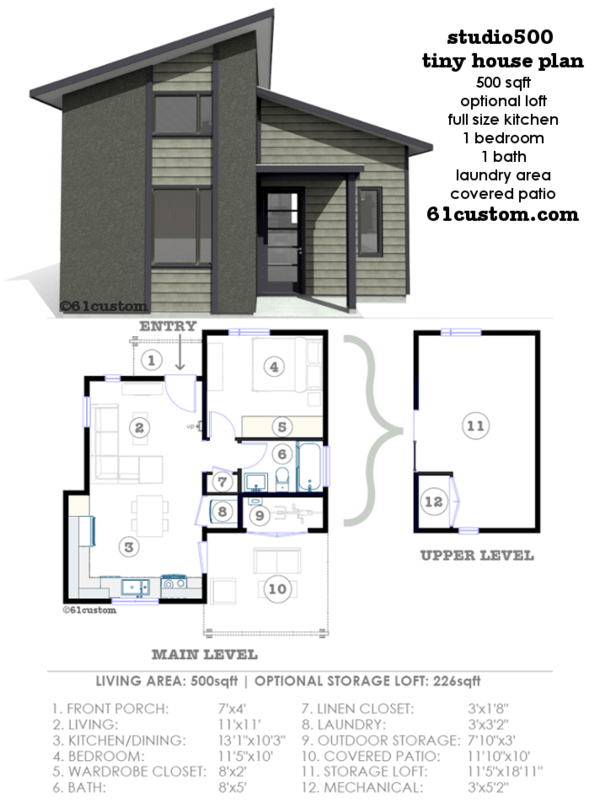 61custom will verify your option choices with you and produce your unique floorplan for review. 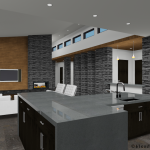 Sign-off on your semi-custom floorplan, and 61custom will draft your customized plans within approx. 14 business days. 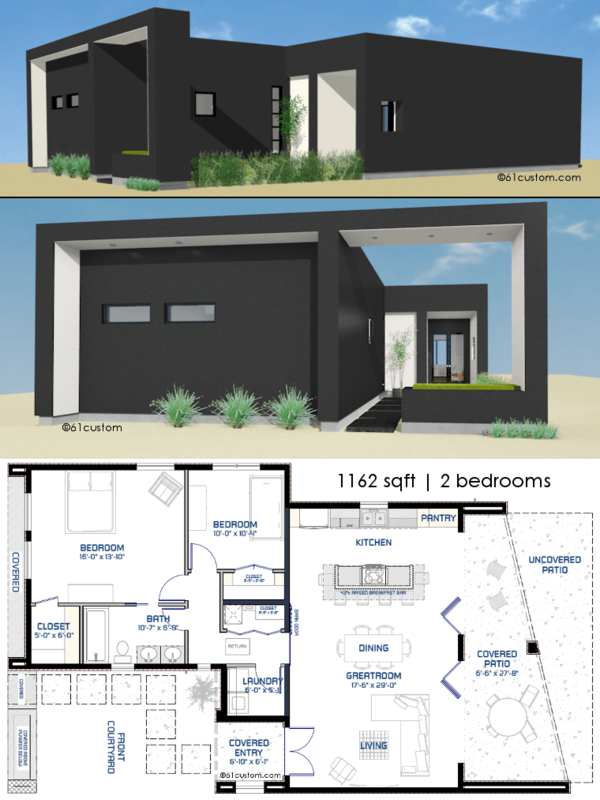 Plans are sent out to you via email and include a license to print as many copies as necessary to build one home.